Stella Sarvage (nee Breus) - Edmonton's Burial & Cremation Professionals | Trinity Funeral Home Ltd. 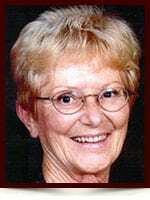 It is with sadness and loneliness that we announce the passing of Stella Sarvage at age 81 years as a result of cancer. Stella leaves to mourn her loss, her husband of 56 wonderful years, Donald; two children, daughters, Gay Marie and Nancy Anne, two grandchildren, Christopher and Michelle, and son-in-law Peter. Stella was predeceased by her parents Joseph and Katherine (Lonoway), her sister Vera (Clarence) and brother Meter (Audrey). Stella was born and raised in Yarbo Saskatchewan. Stella was an honors student at her high school in Esterhazy, Saskatchewan, and an honors graduate at Misericordia Hospital School of Nursing in Winnipeg, Manitoba. Her nursing career was extensive as she worked in various hospitals in Manitoba, Saskatchewan, Alberta and British Columbia. Stella loved golf, and two of her crowning moments of the game were, when she scored a Hole in One at the Springs Course in Radium, and when she scored an Eagle at Twin Willows in Edmonton Ladies League. Cremation has taken place. At Stella’s request a memorial service will not be held. I have so many fond memories of hilarious times with Stella on the farm in Yarbo and in Esterhazy. I have a photo of Stella and I posing by the lake, Stella is playing an accordian and I am pretending to play trumpet. I’d love to send it to you. Contact my daughter Tara and she can email it to you – tneate@sympatico.ca. My deepest sympathy at this difficult time.